Vacation Bible School. That’s just for kids, right? Silly songs. Silly skits. Silly costumes. Kids stuff. Sure. But is there any message in Scripture that God delivers just for people 12 and under? We older and ‘wiser’ ones sometimes make faith so complicated when the simple beauty of truth is what we really need. This week, I’ll be singing songs and doing those silly skits from Group Publishing’s Weird Animals VBS at my own church. Here on the blog, I’ll be sharing with you those same stories, the same lessons, the same truth, but for grown-ups. I wish I had my four-year-old’s bravery. She’s this tiny powerhouse of courage, stepping onto roller coasters and water rides that drop you straight down and splash you in the face as you land. She handles shots, injuries, and dental repairs without tears or drama. I’m tossing and turning at night, not thrilled at the thought of food, outright terrified, edgy and far too prone to cry, and I’m wondering how I can bottle up this tiny daughter’s courage to fill up my own wimpy soul. Funny how trying to obey God, trying to step out and do what He’s called you to do can be exhilarating and frightening at the same time. Sure is like a roller coaster, I guess. But you know what? I hate roller coasters. Maybe that’s what makes this so difficult. In one month almost exactly, I’ll be swimming in a huge ocean of other writers at my first ever writer’s conference. It may be a month away, but the battle is here and now. What if everyone is better than me? What if every woman there looks more polished and more confident and has all the style and pizzazz that captures attention and I’m the easily overlooked tag-a-long that no one remembers? What if I stumble over my words? What if everyone hates what I write or hates my ideas? What if I’m just not good enough? What if I make all the sacrifices to be there and walk out with nothing more than capital F Failure and capital R Rejection? God calls us to daily obedience. That’s hard enough some days. Then sometimes He calls us to all-in, risk-everything, put-yourself-out-there, this-is-crazy kind of vulnerability and trust. It takes courage. That doesn’t mean you aren’t afraid. 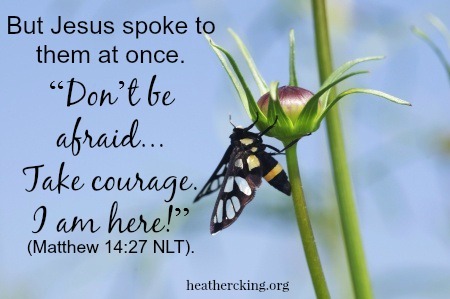 Courage means you obey Him even when you’re terrified because you trust Him with the results. The disciples had that courage. They walked right away from their fishing nets and steady paychecks. The prophets spoke up for right against all that was wrong despite raging kings and queens and the bounties on their head. Esther stepped into a throne room not knowing if the king would kill her or lower that scepter and hear what she had to say. Paul strode into city after city and taught in the synagogue every time, knowing he faced the possibility each time of stoning, imprisonment, beatings, death. Write the proposal. Come up with a tagline. Pack a briefcase. Print business cards. Connect with other authors. Build a platform. Choose a snazzy outfit. Get your hair cut and colored or at least maybe some highlights (maybe that terrifies me more than anything). Most importantly: Pray. Pray some more. Pray every single day. Here’s what I need: Holy Spirit courage to do what He’s called me to do and leave the rest up to Him. But Jesus spoke to them at once. “Don’t be afraid,” he said. “Take courage. I am here!” (Matthew 14:27 NLT). Take courage because He’s here, right here with you, present with you, not abandoning you, not sending you out all by your lonesome self. Ananias needed courage like that, too. The Lord called Him to seek out a man from Tarsus named Saul. Not any Saul from Tarsus either: THE Saul from Tarsus, the notorious Christian-persecutor and murderer. Risk it all, even death, and obey? He knew the cost. Ananias recited the risks for God, as if God clearly didn’t know the details before sending down the divine orders. “Lord,” Ananias answered, “I have heard many reports about this man and all the harm he has done to your holy people in Jerusalem. And he has come here with authority from the chief priests to arrest all who call on your name.” (Acts 9:13-14 NIV). “But the Lord said to Ananias, ‘Go….” (Acts 9:15 NIV). Maybe God has called you out, asked you to do something that takes true courage and your heart just trembles at the thought of the call. Take courage, dear one. He is with you. Even when you’re afraid, Jesus loves you. He knows the risks. He knows what makes your heart quake. He knows the results. And He promises to be with you. May I ask this of you? Would you pray with me and for me this month as I prepare to go to She Speaks in July? I am so blessed by your prayers for me! Hi Heather – I LOVE these VBS lessons for adults! Did you write all of these lessons for adults, based on your VBS theme this year? You should consider publishing them, if so! I’ve been the VBS director at our church many years in the past (took this year off), and I know that the adults would have enjoyed these lessons. Of course, most of the adults who attend VBS are all working with the kids, but still, this might be an enticement to the adults who aren’t working with kids to attend as well. Great job! I’ve just emailed you about joining the Ruby Blogger Team, and I would really like to share and link back to these lessons. Let me know what you think! Thanks so much, Nina! I’ve been sharing my VBS lessons for grown-ups for several years to match the VBS curriculum at our own church. It helps me think through what I’m teaching the kids and hopefully blesses others also!! I’ll be in touch!